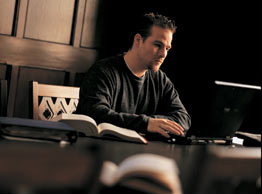 Marquette University offers several joint degree programs for law students. Please remember that a candidate seeking to apply for any joint degree option must file and complete two separate applications: one for the Law School and one for the other degree program. The Law School, in conjunction with the College of Business Administration, offers a program of joint study leading to a Juris Doctorate degree and an MBA degree. Joint program students complete 81 credit hours in the Law School and 24-30 Business credit hours beyond required foundation courses in the MBA program. Up to 18 hours of a JD/MBA student's course work will count jointly toward both degrees (9 hours of Law School credit may be applied to MBA requirements and as many as 9 hours of MBA credits may be applied to JD elective requirements). Most students successfully complete the combined MBA/JD program in 3 to 4 years. This is done by blending MBA and Law requirements during the 2nd and 3rd years of Law School. More information can be found on the Business School's website. The joint JD/MBA in Sports Business is offered through Marquette University's Law School and College of Business Administration. The program enables students to earn both degrees in less time than if each degree were pursued separately. By also earning the National Sports Law Institute's Sports Law Certificate, Marquette students have the opportunity to combine their knowledge of sports law with a graduate business education that will provide them with a unique package of educational credentials that promises to be attractive to sports industry employers. Graduates will acquire knowledge and understanding of the theoretical and practical legal and business issues likely to be encountered by sport organizations in the 21st century. The hallmark of the joint degree program is the readily transferable legal and business knowledge and skills learned in both programs, which can be applied to a wide range of employment opportunities outside the sports industry. Students interested in participating in the JD/MBA in Sports Business joint degree program must separately apply to and be accepted into Marquette's JD and MBA programs. Students generally enroll at Marquette University Law School and complete the required first year law curriculum before beginning to take classes in the MBA program, or any sports law courses that are available for second or third year law students. Typically, students enrolled in the joint JD/MBA in Sports Business program will take between 3 and 4 years to complete the requirements to receive both degrees. However, students have up to 6 years to complete the MBA degree, and up to 4 years to complete the JD requirements (6 years for part-time students). Additional information on this joint program can be found here. The joint J.D./M.A. Program in Law and Political Science or International Affairs allows students to complete the two degrees in 4 years, whereas pursuing them separately would require 5 years. This is possible because up to 18 hours of student's course work will count jointly towards both degrees (9 hours of Political Science credits may be applied towards the law degree and 9 hours of Law School credits may be applied to the Political Science degree. Students seeking admission to the dual program must apply to both the Graduate School Department of Political Science and the Law School. Students must meet the admission requirements for each, but their application to the Graduate School may include LSAT scores in lieu of GRE scores. Additional information regarding the joint J.D./M.A. Political Science can be found here. More information regarding the J.D./M.A International Affairs can be found here. The joint J.D./M.A. Program in Law and Applied Philosophy or History of Philosophy allows students to complete the two degrees in 4 years, whereas pursuing them separately would require 5 years. This is possible because up to 18 hours of student's course work will count jointly towards both degrees (9 hours of Philosophy credits may be applied towards the law degree and 9 hours of Law School credits may be applied to the Philosophy degree. Students seeking admission to the dual program must apply to both the Helen Way Klingler College of Arts and Sciences Philosophy Department and the Law School. Students must meet the admission requirements for each, but their application to the Graduate School may include LSAT scores in lieu of GRE scores. Additional information regarding the joint J.D./M.A. Social and Applied Philosophy can be found here.